I should really call this one more of a preview than an official renegade review. However, I would be remiss as a burgiatrist if I didn’t report my findings. A few weeks ago, I went to my nephew’s graduation from ECU in Greenville, NC. We had about an hour to kill before one of the ceremonies we were going to, and he suggested we stop at Sup Dogs. Boy, was that a great idea. The burger selection is good with innovative toppings and combinations for what is basically a college hangout. 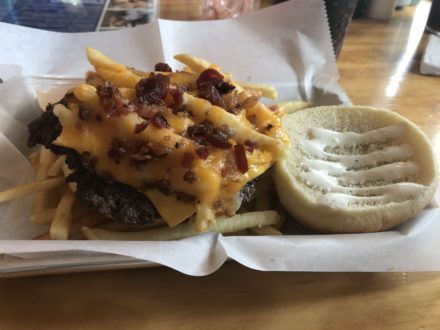 I ordered the bacon cheese fries burger. Randy Jackson would be proud. It had just the right amount of everything on it. Nothing spilled out as I ate it. It was a smash-style burger which, unfortunately, was way overdone. It’s an easy thing to do with a thin patty. However, the build was great. They didn’t bother with lettuce and tomato which similar places will throw on there because they feel they have to. The brioche bun was toasted on the griddle and held up well. At the time, I lamented that I would be unable to get another chance to enjoy Sup Dogs. On my return to the Triangle, I learned that there is one on Franklin Street in Chapel Hill. My preliminary rating is a 3.75 out of 5, but look for our official review coming up in the next few months. I have high hopes that the overdone patty was a fluke, and this could be a 4.25 or 4.5. Fingers crossed.